Did he know the Lord? A defender of the poor. 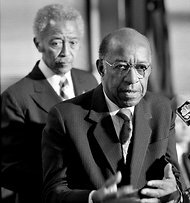 The first black welfare commissioner in the nation’s history and the first social worker to oversee welfare in New York. Dean of Fordham University’s graduate school of social service. New York lost one of the most notable man recently. He’s got one heck of a resume, very impressive and very inspiring. I don’t know how some remarkable people manage to lead a life like this. It’s a constant flow into one direction, one purpose, one goal, and in Mr. Dumpson’s case, one very noble cause. It just amazes me, but of course, I have a history of mental illness that prevents me from living life at a normal standard. Where is my life heading to? I have no idea. Honestly, I see no direction in my life. I see God, but the problem is that I see him EVERYWHERE, and so, I lose my direction. Is that a good justification or what? As a small example, here’s one episode. I get a call from Cyndis who wants me to switch my shift with her next Saturday. After hearing her tale, it sounds most urgent according to my judgement. Her grandma’s coming into town and she would really like to spend time with her. If you really, really need me then you can call me as a last resort. I offered, despite my strong sense of reluctance. Then I get a call from Lui. He needs to take his girlfriend to the airport. He needs me to come in for two hours to cover him. That means, I will have to work in the morning, only to go back to work several hours later. I mean, going into work once a day is already dreadful. But it’s Lui, and I see God in action in him. So I said, yes, against my desire. But later that day, I found out that my own dad is coming into town to pick up my mom that very Saturday Cyndis’ grandma is coming to visit. I know God wants her to spend her time with Grandma. I sure don’t want to be the one ruining that reunion. But then what about my own reunion with my dad? Plus mom is going back to Tennessee so I should at least say good-bye if I can’t go back with them like I want to. I am so torn and worried. I wonder if my doing a favor for Lui will make it up in doing the will of God. Why this dilemma, God? Why do you do this to me? I am being pulled by all directions! Can’t you see how much this torments me? I ask and protest. So you can see why I can never make a good president. Or a good commissioner. But James R. Dumpson was. There’s something funny about me. Obituaries is the most dearest section to my heart of the Times. I read about the people who left a big trace in the humanitarian field, and I always ask at the end of the story a question. “But did they know the Lord?” It’s a question that makes my heart breaks almost every time. Not today. My fellow Catholic Mr. Dumpson surely knew the Lord as his life proves. And though my life may prove nothing in that regard, I know there is at least one person(or should I say three persons?) that knows that I know Him. It’s none other than the Lord himself. lilyboat, do you have a spiritual director or at least someone with a solid Catholic theology background that you can talk to, a parish priest, perhaps? I have been praying for one for a while so i hope god will send me a guide soon! That’s good. I prayed for a few months, asking Mother Mary to find me a spiritual director. She sent me a wonderful director who I have been with for almost 3 years. Persevere in prayer. She doesn’t disappoint.